Cultural Weddings: Yoga Inspires Wedding Rings that Mean More Than I Do! I was contacted by Christina of the Sonja Picard collection a few weeks ago regarding their new line of Sanskrit and yoga inspired jewellery. I looked at their site and thought some of the items were perfectly suited for brides looking for a wedding ring with personality: one that embodied the beliefs of the bride and those inspired by the ancient art of yoga. You already know that the wedding ring is the most worn piece of jewellery and it should have a deeper significant meaning: as it does with the Sonja Picards collection. If you are looking for something a little less conventional; here are some ring styles. What appeals to me most is the the rustic-urban and authentic look to this rings. This 14 k yellow gold double eternity band is beautifully engraved with the following 'love is inconceivably, simultaneously one and different'. What a fantastic daily reminder of what your marriage means to you. So here are some more details of Mona & Tavaras beautiful cultural wedding celebration - the reception part of it anyway. 6:00pm ~ Guests entered the reception hall of the heritage house at Chateau Cargill where they signed their guest book which was located on a beautifully decorated entrance table with an embedded glass floral design. 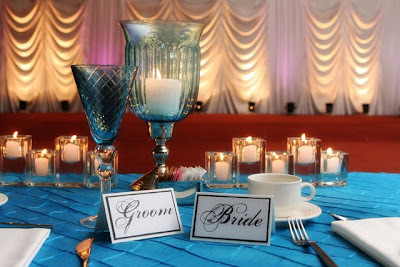 The seating cards were conveniently located here as well Inside the banquet area; the head table was beautifully decorated with gold draping and lights with the theme of hot pink/orange marigold pin ups and lots of candle lights to create an intimate setting. There were crisp white chair covers with gold sashes on each guest chair and the centre-pieces were embedded hot pink and orange marigolds in glass cylinders with floating candle tops. 6:30pm ~ Dinner to start followed by speeches. 8:00pm ~ Guests moved upstairs for the first dance and cake cutting. The cake was made by their friend Raj Birk and it tasted amazing. The setting was perfect along with everything else! So here are the fabulous details from Mona & Tavaras's Cultural - double ceremony wedding. I think my first impression(s) of this wedding is 'light, airy, refreshing, modern and chic'. It is reflected throughout the entire wedding from the choice of colours - creamy beige softens the dramatic and joyfulness of the pinks and orange (btw - orange adds energy and boost to any occasion) and of course the regal detailing of traditional yellow-gold jewellery and embroidery. Here's one of my favorite images from the Hindu ceremony part of the wedding (lush and vibrant haar which were part of the jaya mala ceremony). And of course we wouldn't be able to share any of these with you if it wasn't for their fantastic photographer Amish Solanki. The ceremony and wedding reception venue of choice was The Chateau Cargill located in the South Surrey more on beautiful White Rock side. As each guest arrived, they received a hot pink/orange wedding agenda card with the following message: "You have been invited to share in one of the greatest moments of our lives. This is a celebration of our marriage and our 10 year Anniversary of being together...."
It was truly a fusion wedding with 200 of their closest nearest and dearest gathered for not one but TWO beautiful outdoor ceremonies followed by a dinner reception and night of dancing. It was the hottest day of the year which made i t even more perfect! 3:00 pm: Mona wore a traditional Assamese mehkala (similar to a saree but specific to the region of Assam, India.) Quick geography lesson: Assam is a northeastern state of India. Located south of the eastern Himalayas famous for things such tea and silk. Tavaras wore an atchkin from Sunny's Bridal located in the Vancouver Punjabi market conveniently located at East 49th and Main Street. The ceremony was a truly meaningful family affair and very personal because Mona's grandparents from England conducted the actual Hindu ceremony. 5:15pm ~ Civil Ceremony. There was a quick decor change where the mandup was turned into a modern floral backdrop design with hotpink flowers dangling from the pillars and pedestals covered with rose petals. The bride and groom also changed into their western attire to celebrate the western aspect of the civil ceremony. Mona wore an off-white wedding dress from Lisa's Bridal in New Westminster (for brides still looking for the perfect wedding dress - several brides we have featured in the Cultural Wedding Planner each year have purchased their dream wedding gown from Lisa's Bridal - so before you make your choice - take a trip down wedding lane in the heart of New West where you will find the an array of wedding related shops. Tavaras wore a tuxedo from Leading Man Tuxedos also located in New Westminster. Mona's bridesmaids wore hot pink mehkalas that her mom had made in Assam. If you take a close look at the picture below you can actually see Mona's business partner of Decorating Divas Design - Ravinder. Not only did she have to fill the shoes of a beautiful bridesmaid she was also repsonsible for all the florals including Mona's bridal bouquet, the bridesmaid flower ties and the lapel pins for the wedding party. She also juggled the responsibilty for the chic decor!!! Well done Ravinder and the team of bridesmaids who gave her a hand. And I LOVE the colour of the mehkalas - for brides thinking about incorporating pink into their overall wedding theme; there are such a humungous number of pink options. It's soft, femine and can be paired with black, brown, orange, and platinum or simply put together with different hues. I also especially love the use of the marigolds in the decor. They were smart to go with locally grown (enviro-friendly choice). Marigolds are often overlooked as a choice in floral decor but definitely versatile and something to consider. In weddings taking place in India, sometimes they decorate the wedding vehicle with garlands of marigolds - hmm there's a thought. Okay, a few more details: as they entered, Mr. Headley played the Trinidadian steel pan drums and the ceremony was conducted by JP Mr. Bob Buzza. I'll post some of the detail shots tomorrow. Congratulations to both Mona & Tavaras! 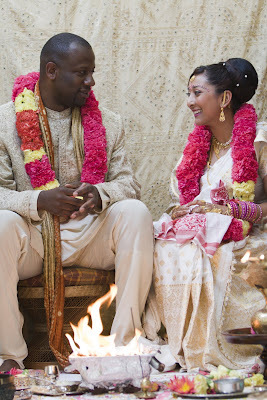 Mona of Decorating Divas emailed me gorgeous images of her double ceremony: a cultural Hindu and Civil ceremony. I will be posting details this week so stay tuned. By the way: Uma of Uma Aesthetics did her hair and make up and she looks absolutely incredible!!! 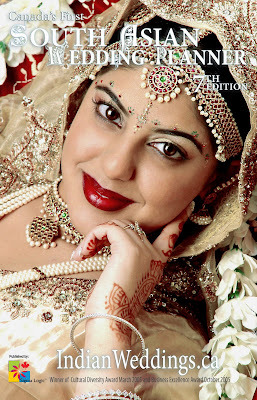 Just another shining example of how brides can look like a Diva on their wedding and still look like themselves. Will post more later. For many of you who are about to participate in a Hindu wedding either as a bride or groom or have been invited to one; you need to know some of the basics of what's going on. It just makes it that much easier and more enjoyable when you can actually understand some of the underlying symbolism that's going on. 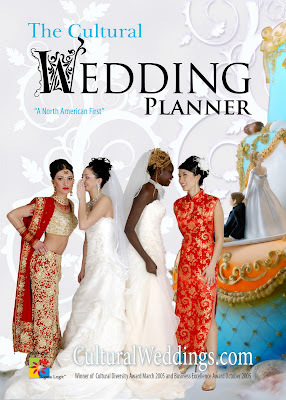 I'm going to keep it short here but for those of you want to know the intricate details that are often involved in this lengthy wedding ceremony; be sure to pick up your latest edition of The Cultural Wedding Planner - 5th Edition order your copy at www.culturalweddings.com. Oh and in case you missed it; yes I said lengthy. Even if you take the 'Coles note version' of the sacred vows; 90 minutes is rushing it according to the puchari (Hindu priest) and the fact that most of the ceremony is conducted in Hindi; well some times makes it hard to understand. Before I get to some of the important elements of the Hindu ceremony: here are a couple of tips to help guests get more out of a ceremony that they aren't really familiar with. 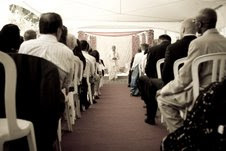 First, have a ceremony programme (that actually explains what's going on - so your guests can understand and really appreciate the sacredness of a Hindu wedding. Need help let me know and I'll see what I can do 2) See if the priest can conduct the ceremony in both Hindi and English. It keeps things interesting and everyone understands what's going on 3) Yes, this is super important. Start the ceremony on time!!! Don't be casually late for your own wedding. Trust me, everyone will be looking at you on your wedding day - even if you arrive on time! Okay then, here are Hindu Weddings 101. The actual ceremony will be conducted under a mandap (a four posted canopy similar to a Jewish huppah). The four pillars represent the parents of the couples - symbolic of supporting the marriage. Kanya Daan is when the father of the bride formal 'gives away his daughter' by placing his daughters hand in the hand's of her husband to be. 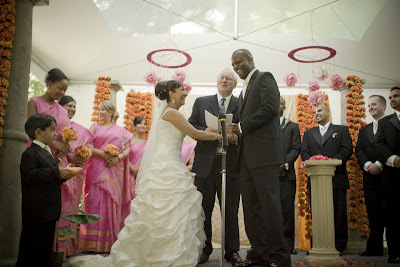 When the bride and groom come face to face at the mandap they exchange garlands with each other. This is formally known as the Jaya Mala ceremony. The priest will recite prayers and the Ganesh Puja will begin. Lord Ganesha (who takes the form of an elephant) is renowned as the 'Remover of Obstacles'. 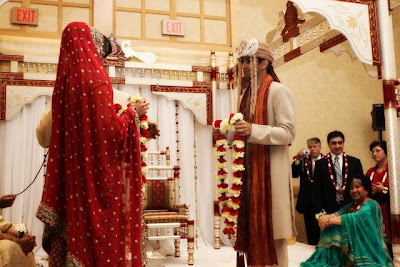 Prayers are recited to him to ensure that the marriage is free of hardships. Along with this prayers are recited to the Nine Planets knows and Nava Graha. Again the purpose of this is to ask the deities for peace and prosperity. After all this (which by the way isn't really all of it) - the actual ceremony will begin. Phrases from the Vedas (The Hindu holy book) are recited. One of the keep parts of Hindu weddings is the presence of fire: known as god Agni. 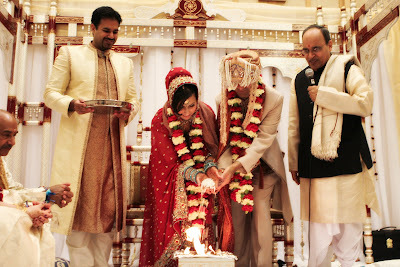 Fire symbolizes purity, power and light and acts as a witness to the sacrament that the couple is undertaking. Okay then, so as we move along the next part will be tying the knot (when the couple the outer parts of the couple's garments together - symbolically binding them together. Then the couple will circumambulate around the fire. Depending the what sect of Hinduism the couple follow: some will walk around the fire 4 times while others will walk around 7. With each circle, the priest is reciting to the couple the couple's responsibilities in their relationship. Followed by this is the ceremony of Seven Steps (or the Promise). The priest will ask bride to ask the groom 7 questions which the groom accepts. The groom will ask one question: the groom asks the bride one question and the bride will accept. Sorry guys: I can't literally translate the questions but they have to do with fidelity, union and devotion. I think you get it. Okay so after this they perform the ring ceremony or mangal sutra (the groom puts a necklace made of black beads & gold around the bride's neck). And now for one of the best parts (for the bride and groom anyway) . The blessings and gift giving. If I didn't mention this before: if you are invited to an Indian wedding of any kind be sure to add an extra loonie with your gift. It's added for extra luck. Elders, family and friends will offer their blessing to the couple and give them some money as a blessing. How sweet is that? Oh and one last thing. This is my version of it. Of course there will be variations to whatever is posted so if you want to add to this: please feel free. We welcome comments and feedback. I've talked about Nita & Sudhir's wedding quite a bit but if you want to know all the details on this duo met: through their friends Dell & Mac be sure to pick up a copy of the latest edition of the 5th Edition of The Cultural Wedding Planner - A North American First or the 7th Edition of Canada's First South Asian Wedding Planner . In the planner you will find intimate details of how other couples did exactly what you are doing: planning one of the biggest day's of your life that include various cultural wedding customs and traditions. But in addition to the little nitty, gritty details: the planner includes many details of suppliers who can cater to exactly what you are looking for. Alongside get inspired as we share some pretty extravagant details of some very thoughtful, unique wedding proposals. Wow! just thinking about how some of these brides were proposed to sends a cold chill up my spine. I'll share some in the blog a little later but if you want this wedding essential guide now: here's how to do it. Oh I forgot to tell you that it's available only in British Columbia right now and quantities are super limited - what's left of them anyway. Here's what to do: get to your nearest Bay Gift Registry (HBC) and ask them for one. Of if you are close enough you can buy one from Indigo / Chapters Bookstore located at (72nd & Scott Road) in Surrey British Columbia. If you are just too busy with other stuff going on in your life right now, we'll make it easy. Contact us via culturaweddings.com and we will courier a copy via express post to you for $14,.95 and you will have it in your hands in 3-4days. More to come. Congratulations to Mona of Decorating Divas! I just heard that she recently got married and will be sharing all the intimate details and some stunning images of her wedding. We're so excited for her. They have been part of cultural weddings family since 2003. Both Ravinder and Mona (principal decorators) are sweet and very accommodating. Their style is clean and contemporary and plus did I mention they are super nice. They also offer the DIY bride to rent out. 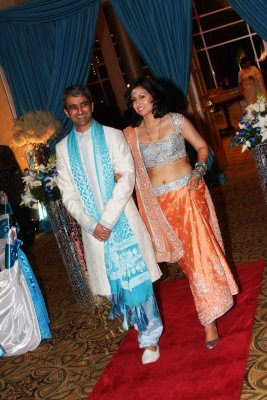 Nita's look: I love both Nita & Sudhir's choices for their wedding outfits. They complement each other perfectly and one does not dominate the other which often happens with ethnic wedding attire (especially Indian bridal gowns). Of course: the bride's wedding gown; more often than not does since it tends to be more heavily embroidered with metallic threads, crystals and intricate beading and stonework. But in t his case: the wedding attire was elegant, sophisticated, soft yet glamorous all at the same time! I guess you could say - just perfect for this couple. For the evening reception, Nita wore an exquisite light salmon (more peachy) lengha paired with an ice blue choli (the cap sleeves and cut of the blouse was absolutely beautiful on her). For the actual Hindu Marriage ceremony : she wore traditional red paired with a teal blue choli. Her maang tikka had blue beads which picked up on the blue embroidery on her pure silk duppatta and her bangles were blue instead the traditional red giving her outfit a modern twist to traditional. Brides keep in mind when you purchase your mang tikka buy a shape that complements your face - not dominate your entire look. And for those brides shopping around for the perfect bridal lengha, I think it's really important especially for those who will need to cover their head for the religious part of their ceremony such as Sikh, Hindu or Muslim weddings that they consider a duppatta that will sit comfortably on the head. Many times designers come up with the most elaborate and regal embroideries which are quite heavy to hold let alone maneuver (50 pounds for the wedding lengha is not uncommon these days). Remember you will be wearing this outfit for at least 6 hours so you should be somewhat comfortable in what you choose. Back to Nita and Suhir: I think they made smart, sophisticated choices when it came to choosing the perfect outfits for their big day. As she did when it came to her "look" for her hair and make up which was posh and polished. She's beautiful without makeup but with the make-up style that she chose; her best features popped and she had that gorgeous, healthy glow that brides have on their wedding day. She looked 'fresh' not heavily 'made-up'. She had her hair in a traditional up-do (simple, clean and carried the duppatta nicely). She chose to keep her hair down which looked glamorous and modern and paired beautifully with the contemporary styling of her evening wedding attire. All around: Nita was a no-fuss bride who was just fabulous!!! I'll continue with more details about Nita and Sudhir's wedding details a little bit later but wanted to share an article titled "How to Keep Your Wedding Classy on A Budget." Deena Waisberg had contacted me while back in the fall to do a story in Canadian Living Magazine about weddings and how couples could save money when it came to financing one of the largest social events of their life. We talked, did the interview and was told that it would be several months before it would actually be published (sometime during the summer). Well, it's finally here (I think it actually came out in May). I think Deena did a great job sharing useful insights and also included details of Buzz Bishop's wedding planning in the article as well. Here's a link to his blog: which has some other useful articles he's published on his blog titled Vancouver Wedding on A Budget. It's practical and real! For those of you don't know: Buzz Bishop is a famous Vancouverite radio broadcaster for Virgin Radio 95.3 Vancouver, writer and webcaster. Congratulations Buzz on your upcoming wedding! Here's a link to the online article as published in Canadian Living Magazine If you want to pick up a copy of the magazine it's the one with the delicious barbecue picture on it. Here are some more beautiful shots photographed by Match Studio You can kind of get a glimpse of the head table which literally looked like the couple were sitting in a cloud. Luxe silk fabrics were draped to perfection thanks to Renee and Joy of Amour Event Designs. Joy also set up a separate table where the bride and groom were seated so that they could view the Shiamak's Indo-Jazz Dance group on stage (wow that group has energy... the best part of that their dance performances is that they are interactive with audience participation). Most fun!!! Just a quick note to DIY brides. To really add dimension to your decor add textured fabric. Look at the whites; you'll notice that it's white but there's a lot going on with the textures. 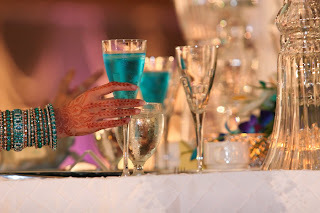 Also notice the that the hints of blue are used subtly; the wine glasses, chair covers and blue gift boxes which had miniature Indian sweets (just the right size - kind of like the two bite brownies. These traditional indian sweets were custom ordered from Prabhu Sweets (based in Surrey BC). If you love Indian sweets you will also love their Ras Malai. Okay back to the head head. Isn't it lovely: perfectly set for the guests of honor: the bride and groom (totally avoids dilemma of who should and should not be at the head table)! Keep it simple and keep it for two! Here's a sample of the table setting. The stage that you see in the far back was used for the dance performances. 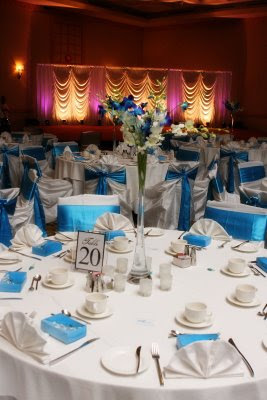 Those beautiful blue sashes are available for rent through . DIY Brides save money and put the sashes on yourself. Rent them from Precious Moment Events. I forgot to mention a couple of important things about Nita & Sudhir's wedding theme. 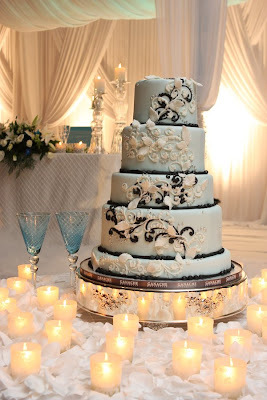 The couple opted to work with 2 decorators instead of one due to the overall size of the wedding and also due to the fact that the reception was overall very large. There were approximately 600 guests who attended the evening dinner reception and approximately 150 guests who attended the intimate Hindu ceremony which took place under a mandap in one of the banquet rooms. The actual ceremony theme was red & platinum and was based on the colours of the actual mandap. But first here is a look at creation created by Ganache Patisserie: one of the finest wedding cake designers based in Vancouver, British Columbia. Oh and thanks again to Rafael. We wouldn't be able to enjoy any of these if it wasn't for him. So for Nita and Sudhir's fabulous wedding. Here are some of the very talented suppliers that pulled it off without a hitch. I have to tell you; these suppliers are wonderful to work with, absolutely talented at what they do, very accommodating, very professional and had the best interest of making Nita and Sudhir's wedding extra special. Decorators: Amour Event Designs - Joy & Renee. I really, really admire Joy's efforts and absolutely adore her style and her dedication to the finishing details when she does her decor. One of the things that really sets Amour Event Designs a part from other decorators is the fact that she really sees the big picture that really fine tunes the details. Precious Moments Events & Designs - Jesse is another decor and rental company that can provide you rentals or do the full blown set-up for receptions. 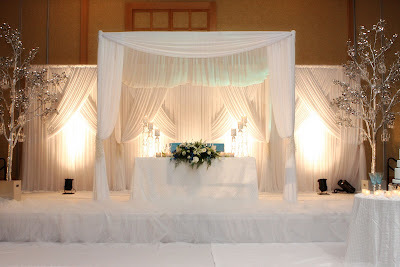 For this wedding: Precious Moments Events & Designs did the decor for the Mandap (which was provided by the very talented and beautiful Radha - previous host of What's New in Vancouver). The decor for the mandap was in other colours but we'll get to that later. Flowers by Delta Flowers: Suki's flower shop - Delta Flowers is conveniently located in the heart of Surrey British Columbia. 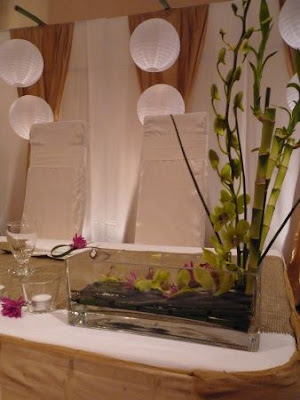 She offers fresh, affordable arrangements for most occasions and outdid herself with the blue orchid centre pieces she provided. 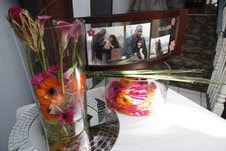 Everyone involved with the wedding loved all the variations of flowers that she brought in to the meeting but opted to go for a simple yet elegant choice for the arrangements. We wanted something simple that would add colour (of course in shades of the overall theme of blue). Shushma Ji wanted something simple and elegant and that's exactly what Suki delivered . Wedding Cake: Peter by Ganache Pattisserie. Amazing work of art that tastes equally splendid.